A white mist hangs over the Campbell River in the mornings. The river flows swiftly and is so shallow it kicks a lot of moisture up into the cold (by BC standards), winter air. Seabirds, mostly Glaucous-winged gulls but occasionally Common mergansers or the odd Hoodie, when they take a break from paddling are swept downstream so fast I barely have time to grab my binoculars before they’re gone. Although only a few kilometers from its headwaters in Campbell Lake to its estuary in Discovery Passage, the Campbell is an important salmon river, with five kinds of salmon and two of trout fighting their way upstream to spawn at different times of the year. It’s the end of February, and the Cutthroat should be running soon. I know because the Bald eagles are gathering: there were three of them in the Douglas-fir beside the house yesterday, two adults and a mottled, untidy juvenile nervously anticipating its first taste of trout. 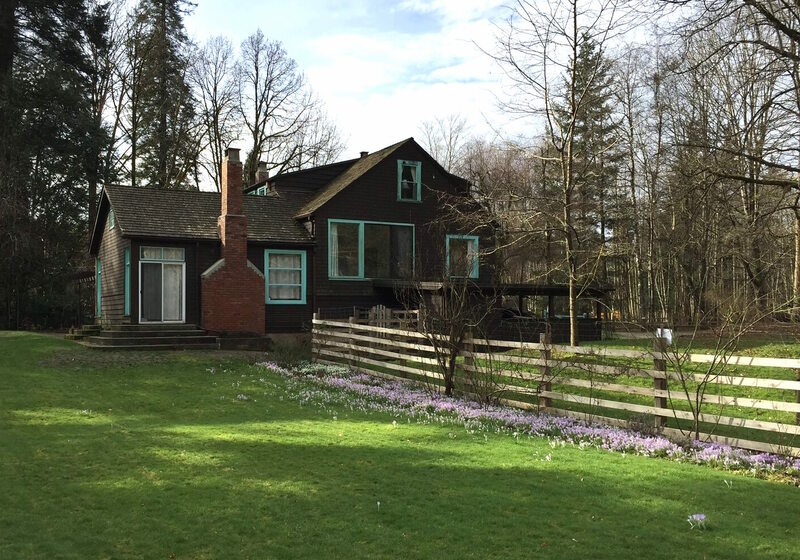 The house is Roderick Haig-Brown’s house, a stately, cosy writing retreat on the Campbell River, just outside the town of Campbell River, on Vancouver Island about three hours north of Victoria. The North Island, as the region is known. The North Island begins at the Malahat, a stretch of the Inland Highway (Highway 19 if you’re looking at a map) just this side of Victoria. People speak of the Malahat as though it’s a border. A few months ago, when the Malahat froze over (a rare event) and was closed to traffic, I happened to ask a Campbell-Riverite how long the North Island would be cut off. I knew that, although I never met him. He died in 1976. His house, now administered by the Campbell River Museum, is part museum and part shrine; there are relics of the man everywhere about the place, seemingly untouched since his death. Hanging in a closet off the dining room is his canvas fishing vest, the pockets still full of live shotgun shells. His tools rest where he set them on the basement workbench. In a corner of the library, before a large window overlooking the river, surrounded by a massive fireplace and three solid walls of books, his desk looks like he just this minute stepped outside to check the water level, or went to his magistrate’s office in town to hear a case against a fellow charged with fishing out of season. He’d generally go easy on those who succumbed to merely venal sins – a few hours of community service picking up litter in one of the city’s parks would take care of it. But woe betided anyone caught committing a mortal sin; disturbing fish habitat, for example, or leaking motor oil into the estuary, or driving a pick-up truck across a protected peat bog. Most of the people who admire Haig-Brown never met him. He was one of North America’s best-known fly fishermen, and people who haven’t read his books and who hadn’t been born when he died come to the door at Haig-Brown House and ask me if I’d mind if they walked about the yard a bit. One man drove all the way from Arkansas. I say they are very welcome to do so, and later look out the window to see them standing beside the river, hands deep in their pockets, gazing over the roiling rapids and, I imagine, perfectly landing a Steelhead Bee on the eddying surface of a shimmering pool. There’s the story told about Glen Love of Seattle, who, when he was fourteen and already a devoted fly fisherman, begged his parents to drive him to Campbell River to meet Roderick Haig-Brown, and they did, a twelve-hour trek in those days, and when they got here and had pulled into the drive, Glen was too shy to get out of the car. “Let’s go home,” he said, and so they turned around and drove all the way back to Seattle the same day. Glen Love tells that story in his preface to the 1995 edition of Timber, first published in 1942 and one of the few books by Haig-Brown that isn’t about fishing. I heard the story from Bob Evans before I read it in Timber. Bob, now in his seventies, collects books by Haig-Brown. Well, actually, he collects anything to do with Haig-Brown. He has every edition (except two) of the twenty-three books that Haig-Brown wrote, plus every book mentioned in a Haig-Brown book – for example, The Compleat Angler – plus several books by Lord Baden-Powell, to whom Haig-Brown was related, plus every anthology, magazine, pamphlet, and tract containing words written by or about Haig-Brown, plus Bob’s own quite beautiful wood carvings of every bird mentioned in a Haig-Brown book – a life-size Great blue heron stands in a corner beneath a shelf of detailed decoys of, among other marvels, a Green-winged teal, a Mallard, a Northern pintail, and a Hooded merganser – plus a few other bits of Haig-Brown memorabilia, such as some of Haig-Brown’s diaries and salmon flies. When Bob shows me his collection, displayed in a room in his basement on sixty-five feet of shelving he made himself, he tells me the story of Glen Love not having the nerve to meet Haig-Brown because Bob, too, never met Haig-Brown, although he was friends with Haig-Brown’s widow, the angelic Ann, who survived her husband by fifteen years. And now two ravens are making their insouciant way inland, gliding through the mist above the Campbell River. As with many who achieved near sainthood during their lifetime, there is some puzzlement over the nature of Haig-Brown’s death. One person I spoke to tells me Haig-Brown suffered a pulmonary embolism one afternoon while mowing the lawn I can see through the library window, now sprinkled with scilla and spring crocuses. Ann happened to glance out, perhaps through this same library window I am looking through now, and saw him fall off the lawn tractor, there, beside the steps down to the river, triggering the dead-man switch. Another informant tells me that, according to the emergency-room physician when Haig-Brown was brought into the Campbell River Hospital, he’d had a severe heart attack but was still alive, was in fact conscious. He thought it was a matter of will, that if he concentrated hard enough on staying alive, he would. Lying on the hospital gurney, staring up at the white ceiling, he began counting backwards from a hundred.